Does Eternal Thirst trigger if I cast Act Of Treason + sac? can i activate multiple abilities on the same creature ? I see. I don't usually count Brutality in the "discard spell" category since it's flexible and it isn't 1 mana. I'm not really against 4 Thoughtseize but I don't like being at a very low life total early on in a grindy deck, even with Emperion. It feels like there's not enough margin for error. I've played a Maralen deck once before, and Mana Tithe performed pretty well for me. I also made a Butcher of the Horde deck and just stuck it in because I like it, and it worked there too. I think Crucible is amazing in any grindy Arbiter/Ghost Quarter deck, especially this one since it can be searched out with Maralen. I tend to prefer the grindy lock type of gameplan if it's possible whenever I play midrange decks though, so I may be biased. Maralen is pretty important so I believe it's best not to cut her. Bitterblossom looks like an ok cut, you could go down to 3 Aven Mindcensor as well since they're not good in multiples and not as good as Arbiter, maybe go down to 2-3 Bolt. If you're putting in card advantage going to 23 lands doesn't seem like a bad idea either. Very nice. Pricey but I love it. 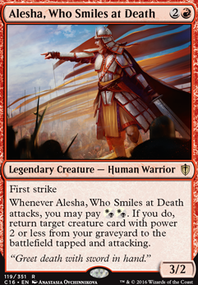 I especially like the athreos/apostle combo. Have you considered Butcher of the Horde? I've always liked Butcher of the Horde but I always felt he was a bit narrow. 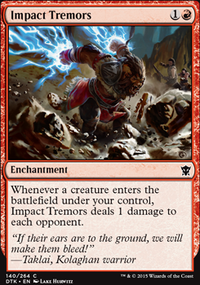 Being Mardu and being a sac outlet is good and all, but I always felt he was still a tad underwhelming. He's not my "favorite" rare, but this is my chance to improve upon him in a way I feel works better. Whenever Butcher of the Masses attacks, you may sacrifice a creature. 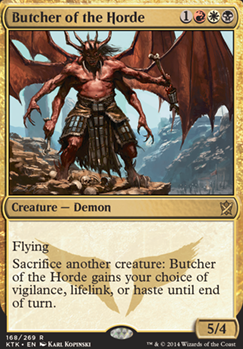 If you do, Butcher of the Masses gains your choice of the following until end of turn: +3/+0, deathtouch, lifelink or menace. Pay 5 life: Sacrifice a non-land permanent you control. Put a +1/+1 counter on Butcher of the Masses. If Butcher of the Masses is tapped, untap it. So the design improves upon him by already giving him haste and improving his toughness by one point. I gave him the possibility of deathtouch to make him deadlier, and gave him the ability to gain menace so that he can be more elusive. Lifelink was kept as an option, because it allows you to "free-pay" for his second ability - a permanent boost in the ways of a +1/+1 counter. This also gives him psudo-Vigilance as you can choose to give him Lifelink, than pay the 5 life to untap him. He becomes a 6/6, so you come out 1 life ahead when damage is dealt. 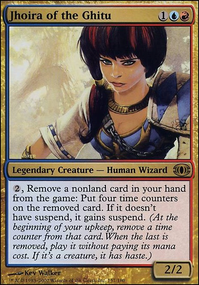 One of the biggest problems with Mardu, in my opinion, is it's overall lack of flexibility. 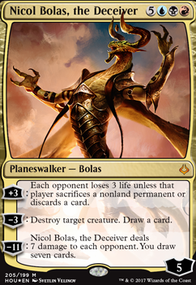 It really doesn't bring anything to the table that Rakdos doesn't already do really well. Yes it does more than Orzhov, and yes it does a lot more than Boros, but really Rakdos and Mardu are essentially the same thing. 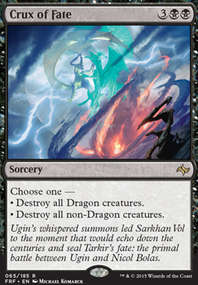 Sure, in Mardu you have access to things such as Lingering Souls and Path to Exile, but splashing a third color for a few cards isn't always worth it. So, I made him more flexible, which I feel makes him more viable. Maybe I'm entirely wrong, but that's my opinion. Mardu lacks true flexibility. Keep it up: Turn your favorite rare into a mythic. Hey folks, I would like a little input on this deck. Based on the Abzan Rites deck from SaffronOlive. Butcher of the Horde is basically a placeholder for the moment, pending suggestions and testing. Budget means I need to forgo fetches and shocks for the moment, but are in the cards. That said, I welcome non budget options for future iterations of the deck. Thanks ahead of time, everyone. Creatures you control with Lifelink have Doublestrike. "Perhaps their ravenous nature could be manipulated to our advantage?" To date, after 25 years of Magic's history, only one single Demon has white. Butcher of the Horde. Meanwhile, there are ten Angels with black, three of which are Mono-Black; Crypt Angel, Fallen Angel, and Desolation Angel. Challenge: Make a Demon that has white. 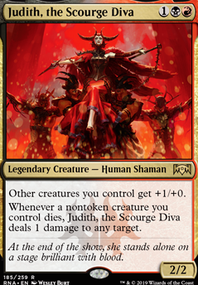 I rocked Butcher of the Horde in a Mardu Allies deck that did well at FNM. Be wary if he invites you over for dinner.